For the personal, marital and family renewal of Christian leaders. ENJOY THE BEAUTIFUL SEASCAPE OF CORONADO ISLAND, A YEAR ROUND RESORT AREA. THE COTTAGE IS A GUEST HOUSE IN THE VILLAGE, COMPLETE WITH BATH AND KITCHENETTE. COUPLES COME TO THE COTTAGE SEEKING INTENSIVE THERAPY FOR A CRISIS IN MARRIAGE OR MINISTRY. THE TIME IS FOCUSED ON UNDERSTANDING, RESOLVING, RECONCILIATION AND PLANNING FOR A POSITIVE FUTURE. OTHER COUPLES SPEND A WEEK AT THE COTTAGE TO ENRICH A MARRIAGE. FAMILY CONCERNS LIKE PARENT-CHILD CONFLICTS, OR ISSUES THAT SURFACE WITH A FORCED TERMINATION ARE ALSO ADDRESSED. THE ONE WEEK RETREAT INCLUDES MULTIPLE THERAPY SESSIONS EACH MORNING AND LATER AFTERNOON FOR INTERPERSONAL CONFLICT, STRESS, BURNOUT, CAREER TRANSITIONS AND SPIRITUAL DIRECTION. THE COST INCLUDES ACCOMMODATIONS AND ALL COUNSELING SESSIONS. PARTIAL SCHOLARSHIPS MAY BE AVAILABLE. EMAIL: waltbecker@aol.com FOR DETAILS. WE ARE NOT TAKING RESERVATIONS FOR THE INTENSIVE COUNSELING WEEK OR SELF-DIRECTED RETREATS AT THIS TIME. The Reverend Walter Becker, Ph.D., received his M.Div. and Ph.D. from Fuller Theological Seminary, where he served as assistant professor of Marriage and Family Ministries. Dr. Becker is the President of La Vie, the parent, 501(c)(3), nonprofit corporation of the ministry at The Cottage. Francoise Becker, MFT, received her graduate degree from the University of Southern California, and an expert in marriage, family and life cycle issues of women. 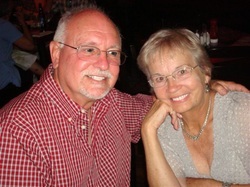 The Beckers have been married for over 48 years, and team to provide a male and female perspective.